We need your input to create Drum Run! Drum Run is a running and drumming adventure project that connects communities and promotes and models health in BC. Drum Run began as an inspirational vision that has been incubated and developed over years. We're now in the initial stages of creating a series of distance runs and Drum Circles, combined with Kundalini Yoga that will ultimately strengthen communities across the province and give us an opportunity to run, and drum, and have fun together. This project is largely about building community, so we want your involvement and input. We're hoping that you'll join us to share ideas. Please bring your fundraising expertise, organizational skills, and suggestions for patrons and donors who want to be part of an extraordinary project! Attend our meeting (online on Zoom) to help us create a clear and powerful vision. Coming soon to your running shoes. DRUM RUN will travel from (and Lyle Povah will run from) city to city, connecting one community to another. The overarching theme is Health, and people of all ages and abilities are invited to run a portion of the daily run with Lyle. If that is not possible, runners may also do their fundraising run on their own time. The tour will also embrace the practice of Kundalini Yoga and will invite DRUM RUN participants to join the daily morning classes led by Lyle. Wherever possible, DRUM RUN will collaborate with First Nations and local facilitators and residents to arrange an open-to-the-public “beginner friendly” inter-generational Community Drum Circle. DRUM - Lyle is an international musician and workshop facilitator (see bio below). He has been at BC Children’s Hospital one day a week for 25 years, sharing drumming and music with kids, parents and staff throughout the hospital. He has a 6 year history with InspireHealth Supportive Cancer Care, leading Drum Circles for the “Life Program”, and teaching Kundalini yoga classes. 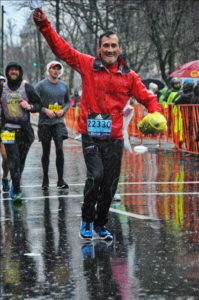 RUN - Lyle has run four marathons to date, Maui Marathon, Great Wall of China Marathon, Vancouver Marathon, and the Eugene Marathon in Oregon. He ran Vancouver and Eugene in well under the qualifying time to be accepted into the Boston Marathon, which he'll run next year on April 16, 2018. YOGA - Lyle has taught Kundalini yoga in China, at YogaOne, Bound Lotus and InspireHealth Supportive Cancer Care in Vancouver Canada, as well as at Mountain Institute’s maximum security prison for men in Agassiz. DRUM RUN will be documented. To date, Lyle has 3 companies interested in documenting DRUM RUN. One person is a world renowned documentary filmmaker. The tour will be bringing along about 75 African drums, so that drums can be provided to those who don't have a drum. Community Drum Circle events will be planned and advertised well in advance through local contacts. Lyle has toured British Columbia over his long history as a musician/facilitator so has connections in many communities. Drumming and Health is inviting participation from individuals, groups and companies that would like to be involved. Runners can fundraise themselves for DRUM RUN, or they can sponsor Lyle with a fixed or per kilometer donation. The scope and tour distances for DRUM RUN are to be determined, with ultimately no limitations for how large the project can be. Various scenarios are being considered. The most likely option is a “pilot project”, a 2018 fundraising tour of about 2 months in duration, to perhaps be followed up with a longer tour in the future. Lyle Povah is a musician, team building drum circle facilitator, researcher and workshop leader, as well as a yoga teacher, with particular interest in the areas of health and community building. He worked for 2 years in China and Japan, leading various therapeutic music and drum circle programs, including corporate team building sessions with IBM China and Joy International. Across 5 of 7 continents, he has utilized drumming, rhythm, the voice, and movement to promote all aspects of wellness. Lyle offers programs at conventions, retreats, hospitals, festivals, and correctional facilities. He presents at national and international conferences, works in health care centres, eating disorder and psychiatry wards, and works with the underprivileged. He also leads yoga and drumming programs for women and men with Corrections Canada at medium and maximum security prisons. Lyle and his company Drumming and Health have conducted groundbreaking research into the health benefits of drumming for eating disorder patients at St. Paul’s Hospital Inpatient Eating Disorders Program. He has also worked at British Columbia Children’s Hospital one day a week for 25 years, runs programs for InspireHealth Supportive Cancer Care, and the BC Cancer Society. Corporately, he works regularly with UBC’s Sauder School of Business and many other organizations, banks and universities. Lyle led a drumming and rhythm motivational event for 900 attendees at Lululemon’s International Leadership Conference in Whistler, Canada, then led the week long “Embody your Expansive Spirit - a Yoga and Drumming Retreat” in Santa Teresa, Costa Rica and delivered a powerful onstage energizer performance at for TEDxStanleyPark for 2,700 people at the Queen Elizabeth Theatre. Lyle has had the honour to have collaborated in this work with First Nations groups (Northwest Territories, Northern Manitoba and BC) such as the Dene, Stó:lō and Katzie Nations. Lyle is part of an international team of facilitators in a week long teaching retreat in Austria, working with participants enrolled with the Wellbeing Project a global initiative that assists social change leaders and organizations focus on inner wellness. Lyle brings transformational drumming and Kundalini yoga.